What is Angels' Eyes Gentle Tear Stain Wipes? 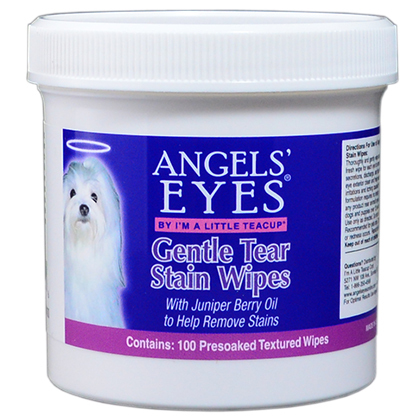 Angels' Eyes Gentle Tear Stain Wipes with Juniper Berry Oil are textured, pre-soaked wipes to help clean dried mucus, secretions and discharge, and help with tear stains around the eyes of dogs and puppies over 12 weeks. Gentle enough for daily use, Angels' Eyes Gentle Tear Stain Wipes help clean the exterior eye area and reduce the risk of eye irritations and itching caused by foreign matter. The no-rinse formulation and pre-soaked, disposable wipes make it quick and easy to clean and maintain your dog's delicate eye area. Excessive tearing, known as Epiphora, causes staining of the fur below the eyes, as well as build-up of dried mucus and bacteria. Textured, pre-soaked Angels' Eyes Gentle Tear Stain Wipes help swab away foreign material and help with tear stains. Juniper Berry Oil helps to remove oil stains. The unique formula requires no rinsing and wipes are disposable for easy clean up. For external use only. Use only as directed. Use caution when using any product near your pet's eyes. Do not use directly in your pet's eyes. Recommended for pets only. Discontinue use if irritation or redness occurs. Repeat daily for best results. Keep out of reach of children. Thoroughly and gently wipe around your pet's eyes using a fresh wipe for each eye to remove dried mucus secretions, discharge and help with tear stains. Use daily to keep eye exterior clean and help reduce the risk of eye irritations and itching caused by foreign matter. For external use only. Use caution when using any product near your pet's eyes. Do not use directly in your pet's eyes. Gently wipe around your pet's eyes daily, using one wipe for each eye. Purified Water, Cocamidopropyl Betaine, Disodium Oleamido MIPA Sulfosuccinate, Juniperus Communis (Juniper) Fruit Oil, Chamomilla Recutita (Matricaria) Flower Extract, Aloe Barbadensis (Aloe) Leaf Juice Extract, Carthamus Tinctius, (Safflower) Seed Oil, Retinyl Palmitate (Vitamin A), Tocopheryl Acetate (Vitamin E), Gluconolactone, Citric Acid.